My friend from North Carolina, Carol, sent me the link to an interesting embellishment blog, In a Minute Ago by Sharon Boggon. Carol is always finding interesting things on the web. 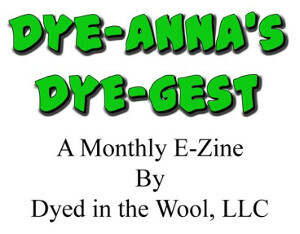 This one is not specifically a weaving, spinning, or knitting blog, but it deals with textiles (both contemporary and historical), fiber arts in general, quilting (especially crazy quilting), needlework, and embroidery. It also has a fantastic stitch dictionary, which all embroiderers and embellishers will be interested in. I like this blog because quilting and embroidery were two of my first textile loves. Quilting is part of my family heritage. 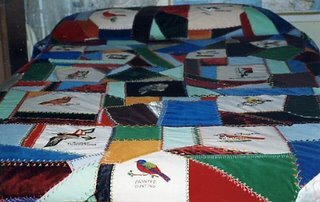 I remember my great grandmother hand sewing quilt after quilt. Sara Lamb has an interesting comment on her blog about being a single project person (an SPP). I’ve thought about that and wondered how it applies to me. I usually have a project on one of my spinning wheels, something on the loom, and one or two knitting projects at hand. But I finish what I start. There was a time in my early life however, when I started many things and finished none. My problem was that I didn’t have the self discipline to finish anything. When a new impulse struck, I was off and running. Somehow the crazy quilt was my turning point. My enthusiasm for it as a project was long gone, but I knew that I had to finish it. I knew that I could never go on to anything else until it was done. I lamented having ever agreed to do it. I agonized that there was still so much to do on it. Finally, my family had a conference and told me I had to finish the quilt. Everyone vowed to help with cooking and dishes and housework to give me time to finish it. So, roughly 12 years after I started it, I finished that crazy quilt. Then I packed it carefully in a box and mailed it off to my folks. I had such a sense of relief! I felt free! Shortly after that I bought my first drop spindle. Later came my first spinning wheel, then my second, then the loom. I haven’t made a quilt since. Sorry for the digression, but crazy quilting does bring back memories. So, back to In a Minute Ago. Sharon updates her blog frequently with all kinds of interesting textile related links. Currently, she is presenting “A 100 Details for 100 Days.” Every day for the next 100 days she plans to feature a different stitch, embellishment, or seam treatment. Today she is on day 8. But …………be forewarned. If you do visit her blog, you’ll find that it’s easy to spend hours here! So nice of you to stop by my blog, so I thought I would return the visit. Enjoyed your story of the family crazy quilt...nice job, too! OK, trying again. Password incorrect. Ridiculous, the password is in the computer memory. Anyway, I used to be a one-project person. I was a sewer at the time and could not afford to accumulate a bunch of fabric in drawers destined never to be sewn. Now it's a bit different. I have only one weaving project going, since I have only one loom. But, I also have two knitting projects going at a time--one long-term such as a sweater and one carry-around, usually socks; two spinning projects as it is much more fun to alternate fibers from spool to spool; but only one occasional sewing project, reserved for weekends. Actually the main thrust of my spinning and knitting are also on weekends--a respite from a week spent weaving. Now, let's see if I can publish this. So now I don't feel so bad about my lone star that has sat in my cupboard for over 9 years. I signed up for a course just after I found out that I was pregnant with twins and after they were born I lost my projects room to them. I am still waiting to get it back in one form or another. Your quilt is beautiful. Such detail on the birds. As to the stick comment on my blog, I honestly don't find much of a difference wether I use the sticks or not. But if I am in a hurry to get the warp on and am not careful with the tensioning while winding on, not much is going to help except winding it again. Which I hate to do. I love the story of your quilt. Funny how we can vacillate for so much longer than it takes to finish the project! I loved your quilt story, especially the bit about a family conference!! Man the family sure was serious about getting that quilt finished!! Nice job. I would love to spin, not weave, just spin. I think there is something terribly romantic about the idea of sitting there at a spinning wheel...can you tell I've NEVER done it. I bet it's hard work. Ditto about Sharons blog, if you don't have a spare 25 hours in your day, don't go visit Sharon.